Tim Knepp and Matthew Peterson come on board to boost the indie broker-dealers high-net-worth platform. LPL Chairman & CEO Mark Casady. LPL Financial (LPLA) said early Monday that it has hired two executives to augment its high-net-worth efforts, which were restructured two weeks ago. The news comes less than a week after President Robert Moore said he was leaving to take another job. CFO Dan Arnold will replace him on Friday. Tim Knepp will serve as a chief investment strategist and chief wealth officer, and Matthew Peterson as a chief wealth strategist. Both will report to Burt White, managing director and chief investment officer. Knepp has been in the business for 25 years and most recently served as a chief investment officer of Savos Investments, known earlier as Genworth Financial Asset Management and a division of AssetMark. He will be based in Charlotte, North Carolina, and will oversee and deliver investment solutions, tactical guidance, portfolio construction and research support for LPL’s independent advisor, bank wealth, high-net-worth and RIA clients. Peterson will work in Boston and will develop investment analysis for advisors serving high-net-worth clients and help enhance the firm’s wealth platform. He has been in the business for over 20 years. Earlier in his career, Peterson helped found Lydian Wealth Management, a predecessor firm to Fortigent, which LPL acquired in 2012. He joins LPL from GM Advisory Group, an employee-owned investment manager. In late February, LPL Financial said it had begun a $9 million restructuring effort but insisted that its high-net-worth efforts are on track. It is moving the unit from Rockville, Maryland, to its headquarters in Charlotte, North Carolina, and expects to spend some $4.5 million on severance pay. About 10 employees were immediately terminated, according to a spokesperson. According to Gary Carrai, who is leading the renewed high-net-worth effort in 2015, advisors across LPL gained full access to Fortigent through a “soft launch” in the fourth quarter. “Now, they can access Fortigent for their investors and integrate [these services] in order to expand their business-level potential,” he said. The shift at Fortigent comes while LPL is under pressure to boost its financial results. In its full-year 2014 earnings announcement, the broker-dealer said its profits fell 2% to $178 million; on an adjusted basis, they dropped 4% to $259 million. Expenses grew 6% to $4.1 billion last year. 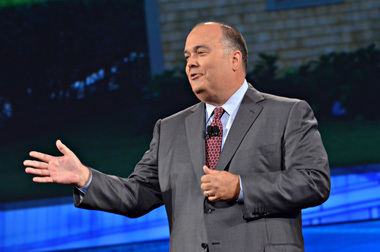 — Check out Moore to Leave LPL; Arnold Replacing Him as President on ThinkAdvisor.